Head over to Minute Maid's Facebook page to print out an $0.85/1 coupon. After that, head over to Coupons.com to print a $0.75/1 coupon. 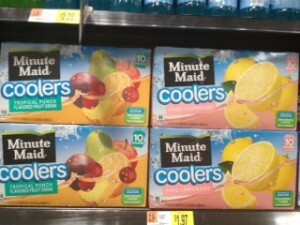 You can use these on the Minute Maid Coolers, which cost $1.97 at Walmart, making 10 juice pouches as low as $1.12!